Do you want to laugh? We’re not just talking about the giggles, we’re talking full-blown belly laughs that make your ribs hurt. John Poveromo is the kind of comedian that can make you double over with laughter and he’s coming to town. The Holly Hotel will host John Povermo and Joanne Filan in their comedy club April 12 and 13. Set the date on your calendar now. Performances are scheduled for 8:30 and 10:30 Friday and Saturday. There is a $15.00 Cover Charge ($12.00 for Dining Guests). Make reservations by calling 248.634.5208. 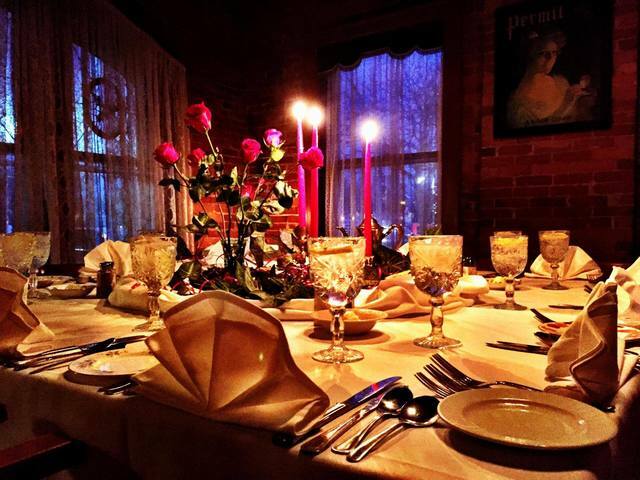 Make it a full evening by enjoying dinner at this historic dining destination. Classic, traditional ambiance and service are the hallmarks of the Holly Hotel. Candlelit tables and starched cotton linens are standards. The Chef’s of the Holly Hotel begin each day contacting purveyors from all over the world. Fresh Ono, Tuna and Rainbow Runner fish are flown in from Hawaii. Game is ordered from Montana or Texas. Chicken is ordered from Indiana, direct from purveyors that specialize in free-range products. Produce is delivered three times a week from Detroit’s Eastern Market. Regional products, like Michigan morel mushrooms and fiddlehead ferns, are ordered in season from long-established Michigan vendors. All for good reason. The “Signature” portion of the dinner menu is virtually unchanged from 1979, allowing our long-term customers the consistency of always having “their favorites” available. A Brooklyn born Jersey raised Stand Up with the perfect blend of self-deprecation and optimism makes John a dynamic and unpredictable performer that’s both engaging and fun to watch as he struggles to make sense of himself and the world around him. Always open and honest, John’s charm and vulnerability on stage give him the ability to connect with every audience allowing each show to be original, refreshing and funny. In 1983, only two professional Comedy Clubs existed in the state of Michigan when the “Holly Hotel Comedy Club” opened in the lower level of the Hotel. Since that time, local comedians Soupy Sales and Tim Allen have joined with national acts such as Pat Paulsen, Bill Mahar, Judy Tenuta, Jackie Vernon, and hundreds of others for weekly performances.